Ash from an Icelandic volcano once again threatens to halt flights in the United Kingdom. London, England (CNN) -- Airports in Ireland prepared to close overnight Saturday as a drifting ash cloud from an erupting volcano in Iceland prompted the United Kingdom's air traffic authority to close airspace over parts of Northern Ireland. Belfast International, Dublin, Donegal, Sligo and Ireland West (Knock) airports were set to close at 7 a.m. local time, the air traffic authority said. The ash may force more airports to close again next week, the country's Department of Transport said Saturday. If the volcano in Iceland continues to erupt at current levels and if current weather conditions prevail, air travel in Britain could be disrupted between Sunday and Tuesday. "The government is carefully monitoring this situation and the safety of passengers will remain our paramount concern," said Transport Secretary Philip Hammond. 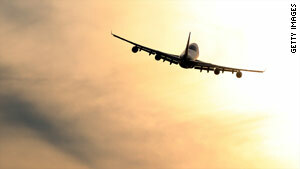 The department said predictions remain fluid, urging passengers to check with airlines before taking any action. British Airways said it would notify passengers of potential disruptions on its Web site. "There is a distinct possibility of some disruption from the ash cloud over the southeast of England but it is too early to tell if this will extend as far as Heathrow or Gatwick yet," a BA spokesman told CNN. Volcanic ash had forced the closing of Iceland's main airport Friday but it reopened at midnight and was operating normally on Saturday. Earlier in the week, traffic was shut down in airports from central Spain to the Canary Islands off the coast of Africa. The problems began in mid-April, when the volcano beneath the Eyjafjallajokull glacier in southern Iceland erupted and sent a cloud of ash into the atmosphere, disrupting international travel for several days. Volcanic ash can be a serious hazard to aircraft, reducing visibility, damaging flight controls and ultimately causing jet engines to fail. British ministers agreed Saturday that five-day ash-prediction charts -- the first of which will come out later Saturday -- would now be made available to airlines, other transport providers and the public on the Met Office website. Previously only 18-hour forecasts had been available. CNN's Caroline Paterson contributed to this report.